I don't even know where to start with this one. When I saw that this album had not only been requested early, but had received by far the most votes on my schedule thanks to Patreon, I was blown away. Not for Katy Perry, not for Rise Against, this - but hey, I was curious too, these sorts of supergroup collaborations don't come around every day. So background here: apparently this started as a commissioned orchestra piece that was performed live back in 2012, but never properly recorded, so Sufjan Stevens rounded up a murder's row of talent to take this score into fresh territory. 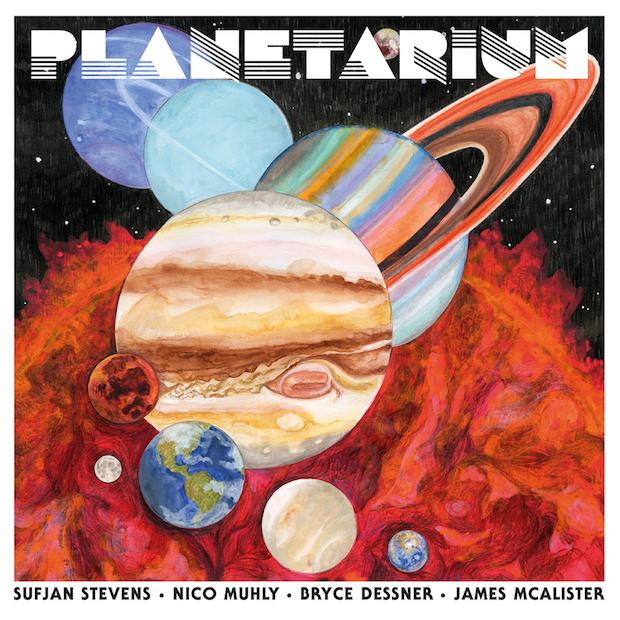 And we've got heavyweights here: Sufjan is a powerhouse in his own right, but when you add in the guitarist of The National Bryce Dessner, classical composer Nico Muhly, and drummer James McAllister, you've got a stacked lineup of talent. And considering these are all songs written about space and our solar system... look, we don't get enough good music celebrating space, I'll just say that right now. Now on the one hand I was really excited to dig into this, but I also know that this could very well play like that Lights & Motion record I covered months ago, a potent piece of music that can feel a little unengaging or abstract to the point of frustration. But still, I was fascinated by what this quartet could do with this material - it's too odd and distinct of a concept to ignore, so what did we find in Planetarium? Honestly, this is a tricky record to evaluate, mostly because it's very hard to evaluate whether it succeeded in what it's trying to do. Actually, that's not even quite the case, because if you take a look at Sufjan Stevens' writing on this project, you can easily make the statement that for what this piece is, it succeeded... in a way. Because Planetarium is an odd project and one that I'm not sure completely works as an album on its own, especially when you factor in the writing that Stevens is providing it, falling somewhere between an abstract theater piece and the backing orchestral post-rock that you occasionally hear in one of the better budgeted science centers and museums you visit with general disinterest on vacation, less because you're expecting to learn anything new and more because you're curious how the tour guides are going to bungle the explanations you already know... but that might just be me. It definitely feels like a commissioned piece, that's for damn sure: the sort of art where a wealthy benefactor chose a high concept idea to challenge or troll the artist, who then turns around to deliver something that'll leave both the people who do and don't understand it a little exasperated - and nowhere is this more apparent than the writing. See, given my - and Stevens' - literary background, I was expecting the callbacks to Greek and Roman myth and the gods that gave the planets their names, a pretty obvious progression. What I didn't expect was Stevens' willingness to plunge into the more lurid details of those myths, which can feel weird when juxtaposed against much of this instrumentation or, hell, even his voice and delivery! I get that it might seem impossible to write human drama out of the cold facts of our solar system, but Stevens goes beyond that into retelling parts of the Venus and Aphrodite myth with his own sexual awakening at summer camp, and then follows it with 'Uranus' where the most prevalent symbol is that of the god's castration. And it gets stranger from there - the twin bloody tales pulling from Aboriginal and Aztec folklore on 'Moon', the cannibalism of 'Saturn', the god of war who wants peace at any cost on 'Mars' that has a startling amount in common with the recent Wonder Woman movie in tone and subtext, it's a bizarre choice and one I'm not sure flatters anyone or anything. Of course, if we want to go deeper than that, Stevens is also injecting a hearty mix of modern Christian iconography on songs like 'Saturn', where he nakedly draws parallels between cannibalism and the Eucharist, which is drawing a weird parallel between two sets of abstract symbols by trying to make them more literal, and I don't really think the underlying moralism makes much sense? The fifteen-minute long piece 'Earth' gets close to some form of explanation, as humanity calls upon God to explain the nature of their existence and then at the end of their lives people recognize the grand majesty of the world and find some form of an answer, but thematically it doesn't really fit the Greco-Roman iconography on the other songs. The two songs I feel are the most cleanly articulated are 'Mercury' and 'Pluto', mostly because they feel the most connected to their respective gods and myths, but can somebody explain to me why Mercury is tacked on to the end of the project, unless it's trying to imply through subtext that we still don't know all the answers in the cosmos, but even then the language is coached more through romantic imagery which is all over this album? And that only highlights a bigger issue: the sequencing of this album is a mess. I was willing to accept that we weren't getting traditional song structures and that the narrative of this piece would feel more abstract by necessity, but in that case the flow and sequencing between pieces becomes all the more important and I can't help but feel that it's not clicking here. The planets are approached in an order that's barely connected, we get interludes surrounding cosmic phenomena like black holes and Halley's Comet, and when you couple it with the sparse extended instrumental pieces and that all of these songs feel underwritten for a record nearly eighty minutes, it leads to a feeling of a lot of dead air - which yes, might be loosely representative of space, but it doesn't lead a progression that allows the moments of crescendo or instrumental climax to hit with any sort of raw power. Part of this is the feel that Sufjan Stevens just might not be the right singer for this material, especially when he dips into an increasingly frail falsetto - when the mix balance and production feels so loud, he feels increasingly disconnected and distant, and no, piling on layers of robotic or vocoder effects doesn't help! Now granted, there are songs where they add some thicker choral effects to solid effect - 'Uranus' is probably the best example with the horns coming off the bubbling deeper beat and the glittery guitar line, although 'Earth' comes close despite having to get through nearly six minutes of blurred over orchestral arrangement and autotune to get there. And this leads to another issue: again, accepting that we aren't getting traditional song structures, you need to have melodic motifs or elements that make specific parts of the movement stand out, and that can be very hit and miss. 'Jupiter' brings in much heavier live drums before a warping strings segment, grinding vocal filters and heavily gated mechanical percussion - which believe it or not actually works for me, a little better than the shuddering main beat on 'Venus' or the weird flattened gloss on 'Moon' with the pipes that sounds like a below-average Visible Cloaks instrumental - there's a really slick melodic guitar line on 'Pluto' that breaks into this operatic strings section, the rapid flutter of 'Saturn' is a desperate and well-appreciated shot of momentum, and I really dug the piano and guitar that played into the ballads of 'Neptune' and 'Mercury' that opened and closed the album. But I'd argue it's 'Mars' that pinpointed my issue with the project: yeah, there's a lot of glitch on the vocals, but I kept waiting for the muscle and swell and grit behind a song emblematic of a god of war, and I didn't get it, and that's when it hit me: this is a record that if not about space is about gods... and yet the moments where it feels cosmic and huge and impressive just aren't here. Part of this is sequencing, sure, and I think a larger percussion section might have helped, but if you're expecting heavier synth or guitar or even a consistent crescendo driven on horns and strings, you don't really get it, or if you do it'll ebb away into movements that just don't have unique or alien character or identity, and certainly don't match how lurid some of the writing gets! I'm not expecting every space-related record to sound like Ayreon, but it's not like the moments aren't here, just rarely expanded to fill the extended runtime that contains a lot of atmsopheric but unremarkable post-rock. Hell, I've heard records from The National contain guitar work with more muscle than what Bryce Dessner delivers here, and when you're writing about the expanse of the cosmos with frequent connections to the bloody exploits of the gods and you can't give it more instrumental weight? Seriously? Look, I know this is coming across as more negative that it probably should, but that's more because this is a profoundly frustrating and odd listen, partially because it does make sense to me. It's not so oblique or confusing in its theme or arc that it can't resonate for me - it's just between the listless arrangements, the baffling contradictions in execution, and the grand moments that feel abortive, I'm left thinking that either something lost in the translation from live orchestra to record, or this was never destined to work at all. As such, for me it's a 6/10, but I do recommend everyone hear it - this is one of those projects that feels so unique it draws my attention, but after every listen makes it abundantly clear it should remain a side project. If you haven't heard it already live, it's worth a listen, but if it sounds out of your element, it very much is - take that as you will.